An “Earfull” from Arsenal Center for the Arts! 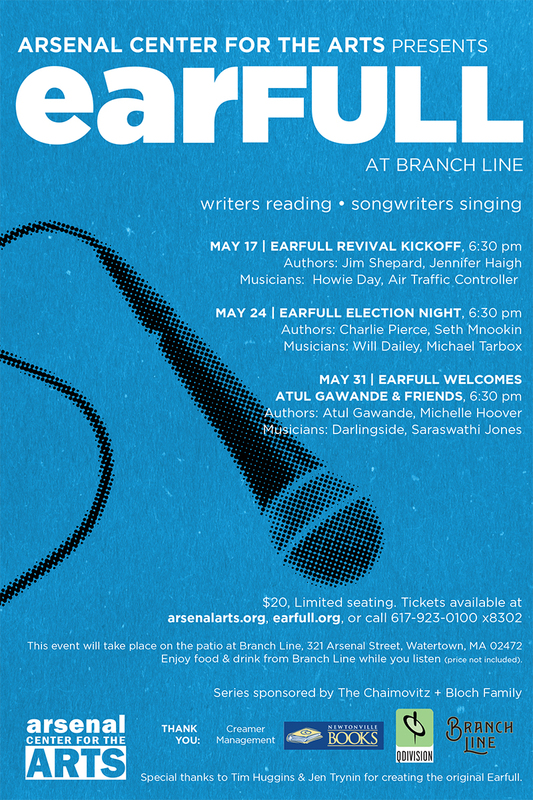 The Arsenal Center for the Arts is proud to present the revival of Earfull – a literature and music series of “Writers Reading and Songwriters Singing” at Branch Line in Watertown’s Arsenal on the Charles complex this May. The “Earfull Revival Kickoff” happening Tuesday, May 17th at 6:30pm will be the first of three events in the renewed series and features Authors Jim Shepard and Jennifer Haigh along with Musicians Howie Day and Air Traffic Controller. The series continues Tuesday, May 24th with “Earfull Election Night” featuring Authors Charlie Pierce and Seth Mnookin and Musicians Will Dailey and Michael Tarbox. And finally, Tuesday, May 31st Earfull Welcomes Atul Gawande & Friends with none other than Atul Gawande, Michael Hoover and Musicians Darlingside and Saraswathi Jones. The brainchild of Boston Musician and Author Jen Trynin and bookstore connoisseur Tim Huggins, Earfull first launched in the Fall of 2001 with the concept that, given a conducive environment, book people will appreciate being exposed to live music, and rock people will realize how cool it is to hear great authors reading their work aloud! EARFULL aimed to provide that environment, combining prominent author readings with established singer-songwriters in the hopes of broadening the appreciation of and audiences for both. After a brief hiatus from multiple sold-out seasons of the series, the Arsenal Center for the Arts is excited to bring back the beloved programming to a whole new audience. Tickets for the series go on-sale April 26th for just $20 at ArsenalArts.org and will sell out quickly. Limited seating is available during the event for patrons to purchase delicious food & drink from Branch Line. Located in Watertown, MA, the Arsenal Center for the Arts is a vibrant multi-disciplinary community arts venue that houses the 380-seat Charles Mosesian Theater, a 90-seat Black Box theater, Exhibition Gallery, Rehearsal Halls, Educational Classrooms, and Artist Studio spaces. ArsenalARTS offerings include gallery exhibits, visual and performing arts classes and workshops for all ages, literary/art discussions and world-class theatrical and musical performances. The Arsenal Center For The Arts is also home to the award-winning Watertown Children’s Theatre, offering year-round theatre education programs, including musical and non-musical productions, voice and acting lessons, and performing arts workshops for children K-12. New Repertory Theatre is the Professional Theatre Company in residence at the center. Arsenal Center for the Arts is a 501(c)(3) non-profit organization. Category: Events · Tags: An “Earfull” from Arsenal Center for the Arts!